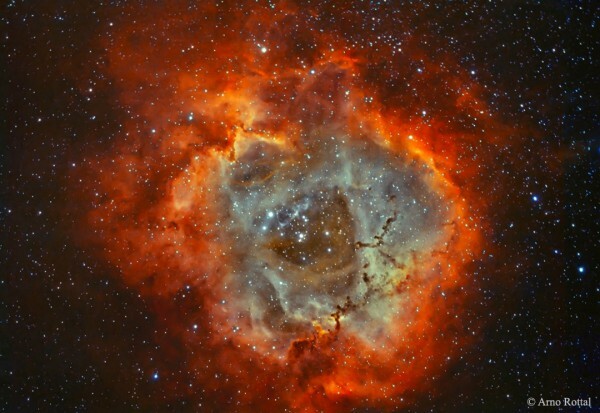 The Rossete nebula is a typical example of that man, the human being, looking something known of what is not known. No, it is not because it is composed of oxygen and hydrogen heated by the explosion of a star not, either because this being the engine to create new stars with their material, either, but because it has a rose. Like “everything tastes like chicken” corresponds to our brain looks most similar to what we are eating to feel good about it, our view does the same. Hence the NGC 2244 Caldwell 50 or 50 light years in radius and about 4700 light years away and is the call, Nebula Rosa. Inside there are stars of 50 times our size and 400 000 times more luminous. Its color comes from the energy of these stars (among others) ionized oxygen (hence the blue) and hydrogen containing this nebula.